Black and White Obsession: Got Witty Witterson? It’s a Jazzy Phizal production -er a Trisha D. production. That my friends, is an all access pass to all the swaggilicious freebies curated by yours truly. SCORE!! Joining its Link Party Page friend in their published state, you best bet they’re ‘chock full of secret goodies. So stop over there and overload your Hard Drive my friends! Back? Alright so-- where was I-- oh yeah priorities. You bet your bacon booties that you’ll begin to see more changes coming soon… who really knows whats in store. No really, I don’t even know. The latest pun to hit Black and White Obsession. Click that little pin it button and magically all the photos on this page ready for pinning. Sing it ‘wit me now: “Uh oh oh Uh oh oh if you like it then you shoulda put a pin on it.” Alright so it’s not the cleverest of ‘em all, but that rock diamond caught your eye, eh? Smart phone friends, your voices have been heard, loud and clear! An easy way to pin my crap I mean stellar work. They’ll be stuffed at the bottom of every post from now on-- and if you’re lucky even some archives if I get my lazy tush around to it. Since this is a special designing post, I thought you’d benefit from seeing that bad boy. Or maybe I’m trying to pull some subliminal messages… pin my stuff (she says in a Count Dracula voice). Ha ha. I love this, Trisha! And thanks for letting me know, so I could come over for a good chuckle. I needed that. Also, you are a graphics goddess. Yes, you're allowed to add that title to your resume. It's true! I love your style...and when I see all the pins popping up on Pinterest now thanks to your new "pin it" graphic, I'll recognize you in a heartbeat because your fonts and graphics are so distinct. Extra credit points for brand development! So glad to get a chuckle outta you!! Thank you for being so sweet, I pour my heart into all the graphics on the site. I'm infatuated with your designs, Moonsteam Design did a really good job!! I love a pun Trisha and this is a good one! You definitely caught my attention with the diamond. 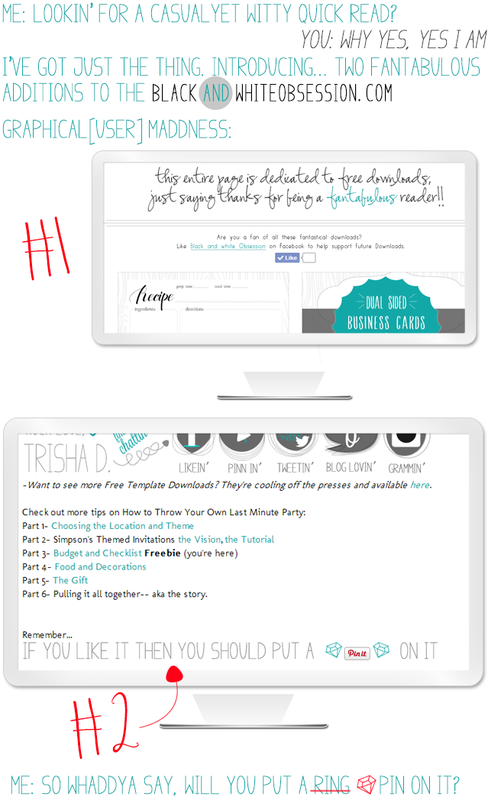 You've done so many freebies that having them in the right place will help tons!